Plow bolts are often confused with carriage bolts. 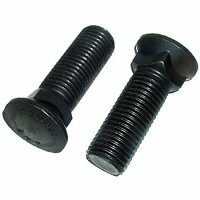 A plow bolt has a flat or countersunk head to allow for a smooth finished surface. Similar to a carriage bolt there is some type of locking base directly under the plow bolt head, most commonly a square base. This keeps the bolt from turning once tightened. The base under the head needs to match the surface the bolt is mated with. The most common use is on plow blades and heavy construction equipment. Plow bolt pictures are a general representation and not an actual picture of the product you will receive. Threads will vary according to the individual bolt sizes and dimensions. ISO standards for threads are: length is twice the diameter of the bolt plus ½ inch. If you are looking for fully threaded bolts please call direct at 800-872-5557.